The most accurate, versatile, easy-to-use targets available now operate in both single and dual-axis modes! available with ZigBee® radio technology. In single axis scanning mode, the targets can be used with Hamar Laser’s continuously sweeping lasers (L-730/L-740 series) for measuring the flatness, straightness, squareness and parallelism of both machine tools and rolls. Several options are available to display the target data: The R-1355-2.4ZB Rugged PDA display, the R-1307-2.4ZB, the R- 1307W-2.4ZB or the R-1308. The targets can also be used in dual-axis mode with our L-705/706/708 Bore lasers for steam turbine applications. The R-1307W-2.4ZB or R-1307-2.4ZB are used to display the data. The targets provide wireless radio communication with up to a 1-inch (25 mm) measuring range, an electronic “zero” function and an operating range of 100 feet (30.5 mm) from laser to target. The A-1519 has a resolution of .00002 (0.5 microns). For applications where greater accuracy is needed, such as surface plates, the A-1520 has a resolution of .00001 (0.25 microns). The targets feature fully linearized, position-sensitive detectors with automatic background- light correction for extremely accurate readings. The A-1519 targets have +/- 0.00015 mm (0.0038 mmm) accuracy and the A-1520 targets have +/- .00006" (0.0015 mm) accuracy over the central 80% of the sensor area. Both the A-1519 and A-1520 can easily be converted to a height gage, as the center of the target has been set to a tightly-controlled dimension. Attach the 2.565" spacer to the base of the target and the exact dimension from laser plane to the measured surface can be obtained. Optional precision spacers are available in 1", 2" " and 6" sizes, all of which are accurate to .0003" (0.0075 mm). The A-1519 and A-1520 packages include the target, a magnetic base and three insert posts(6.25", 4", and 2" or 158.8 mm, 101.6 mm and 50.8 mm) for coarse height adjustment. Completely automatic on/off operation with no switches, wires or connections. The target activates when the laser beam sweeps across the target cell and flashing target indicators provide immediate “off target” status. Powered by two internal lithium ion batteries for long life and usage. Comes with AC adapter/charger, low battery and charging indicators. 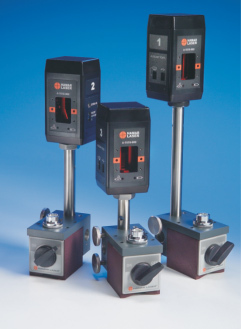 Targets can also be charged with the optional A-1519CS-4 Charging Station that charges up to 4 targets simultaneously. Communication working distance (PDA/PC Base Station to target) is 300 feet (91 M) maximum. Detector Size/Type: 2-Axis PSD 1.3" x 0.51"
Measuring range may be limited by obstructions, antenna type and orientation. Outdoors line-of-sight range, with dipole antenna, may be greater.